Was a missing submarine being chased by a military chopper? THE Argentinian submarine that vanished last month was being chased by a British helicopter and Chilean ship shortly before disappearing, one of the doomed vessel's sailors told his sister in a "strange" message that was one of the last sent from the sub. The sister's account, made public Wednesday, was immediately blasted by Argentinian military officials as "completely untrue" - according to Fox News. But Jessica Medina, whose brother Roberto Daniel Medina served aboard the sub, told Argentina's La Gaceta newspaper in an exclusive interview that she received the message on WhatsApp just days before the vessel vanished November 15. "It was that weird message in which he told us he was looking for a British helicopter and a Chilean ship, but unfortunately we did not continue with that conversation, he stayed there. That was the last message," she said. In his messages, the sister said her brother told her the ARA San Juan was sailing close to the Falklands - referred to as Malvinas by Argentina - on November 3. "On Monday we were looking for an English helicopter and yesterday the Chileans. There is a lot of movement there," reads the message sent by Medina to his family's WhatsApp group. The submarine, which went missing in November, had 44 crew members on board. Source: Argentina Navy via AP File. Jessica Medina added "many" other families from missing crew members also received reports from loved ones that they had been fleeing a British helicopter around the time of their disappearance. Jessica Medina claimed she did not make the message public after the vessel went missing because she did not feel "capable." But she said she eventually made the decision to do so in hopes the lead investigator saw the report. "I think we're not the only family that has something like that, I think there are a lot of them. Judge Yanez will have to investigate," she said, referring to the lead investigator. A Royal Navy spokesman, however, told The Mirror the sister's claims are "completely untrue," adding the British don't have any anti-submarine helicopters based in the Falklands. The navy has said the vessel's captain reported water entered the snorkel and caused one of the submarine's batteries to short circuit. The captain later communicated by satellite phone that the problem had been contained, the navy said. Some hours later, an explosion was detected near the time and place where the San Juan was last heard from. Navy spokesman Enrique Balbi has said the blast could have been triggered by a "concentration of hydrogen" caused by the battery problem reported by the captain. The German-built TR-1700 class submarine was commissioned in the 1980s and was most recently refitted between 2008 and 2014. It was built by a subsidiary of Germany's ThyssenKrupp that is no longer operational. 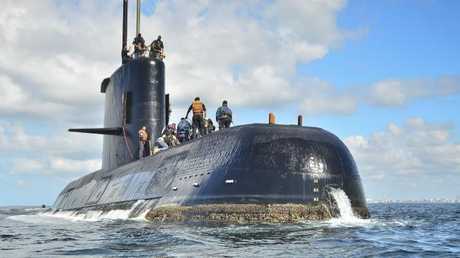 Balbi said a group of navy officials who travelled to Germany in late November to obtain more information about the design of the submarine had returned to Argentina. He said they will submit all documents to a local judge investigating the sub's disappearance.